I work in a great, if interesting at times, part of town. I am within five minutes of the best food shop - Moore Wilson's , just up the road from the most fantastic butcher - Meat, and round the corner from Common Sense Organics. Common Sense Organics is a wonderful place to browse when you pop out at lunchtime to buy your dinner. Not all the products sold are organic but they all have a responsible provenance. Today we agreed that we needed some iron for dinner so I bought a thick slice of aged sirloin from Meat then carried on round the corner to Common Sense Organics to choose some vegetables to accompany the steak. The best thing about this shop is that instead of bags of anonymous potatoes labelled "all-purpose" you can choose from a vast and dirty selection of loose potatoes such as Old Blue and Agria or peruse the numerous types of plums that look like they were just picked from the tree. And this is the place to buy your bulk goods like quinoa, jumbo oats and stone-ground unbleached flour. I just had to buy some baby leeks and tiny new carrots for dinner, a couple of wrinkly passion fruit for after as well as a ginormous radish to eat before my lunch. Oh and some parsley plants to put in my new garden. I was back at work within 15 minutes with a fantastic dinner just waiting to be cooked. 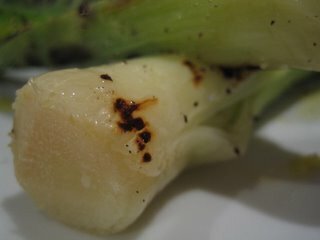 Cut the root off the leeks but leave the bit that joins the layers together. Trim the tops to a length that looks nice without any dry looking green bits. Cut the leeks lengthwise an inch from the root end, keeping the leeks in one piece with the root. Soak in cold water until you think the dirt has dissolved away. Steam the leeks for five minutes or until tender. Dry on a tea towel, then spray with olive oil and sprinkle with salt and pepper. Cook briefly on a hot griddle - ideally while the steak you are also eating rests - until slightly charred in places and begging to be eaten.